Although there were signs of some self admitted weariness as Nell entered the last leg of a gruelling tour, the appreciative audience were willing to forgive and enjoy the opportunity to listen to a comprehensive selection of material from her two most recent albums. The title track from the 2009 release WHAT DOES IT TAKE opened the proceedings and it wasn’t long before those present were treated to ‘Not Like Loving You’, ‘Helen’s Requiem’ and a personal favourite in ‘Green Dress’, all taken from a record that began to establish Nell’s commercial credentials. 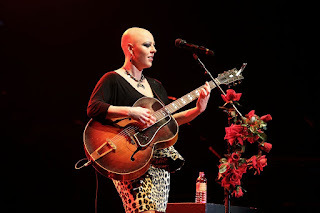 Nell also returned to this album for the pre-encore number as she and her band raised the tempo with the rock orientated ‘Second Time Around.’ The three piece backing band included her tour manager Rick Webster on guitar but they generally had a low key presence leaving the limelight the sole domain for the effervescent Nell, who especially couldn’t conceal her pride when reaching for her Gibson for a couple of numbers. The new album was also heavily featured during the evening with ‘Mercy on Me’, ‘Echoes’ and ‘Buildings and Treetops’ coming over really well live. This new release has a far more pop feel to it than the previous more rootsy sound and you can’t begrudge Nell a tilt at some of the trappings of mainstream awareness and appreciation. However for somebody with an enormous ability to interpret some classic Americana styles, it is hoped that in the future she could veer in this direction and the production would surely be of great merit. To further illustrate Nell’s diversity, the only cover incorporated into this evening’s set was ‘Learn to Fly’ by the Foo Fighters. Though a slightly clichéd rock ballad, Nell gave a fine rendition to inject some variety into the proceedings. While the high profile 2012 support slots helped Nell take her music to a wider audience, she seemed to revel in the opportunity to resume centre stage albeit in the smaller venues especially as these are the fans she can rely on for future committed support. A return to her home cultural surroundings in New York city will enable Nell to re-charge and we all look forward to her future offerings, whatever direction they take her in.